Valentine's Day is less than a month away, so here is a project with heart! 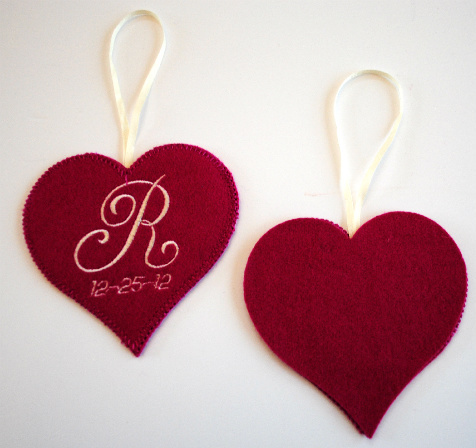 Memory Hearts can be created for any special occasion: births, baptisms, engagements, marriages. These were made for a baby girl and baby boy. Actually, I made two sets of each so that the grandmothers, both first timers, could also have one. You can customize them any way you like. 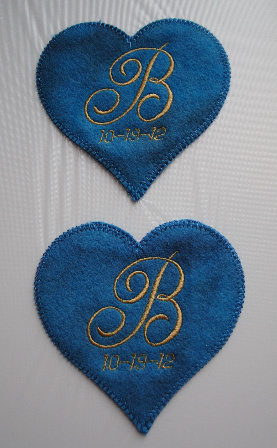 These featured a first-initial monogram and birth date. 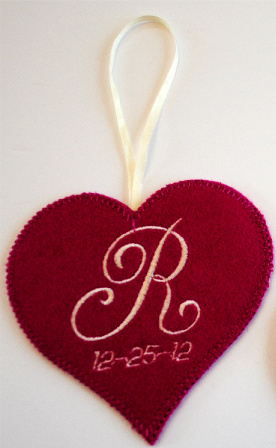 The idea will work with any heart applique design. I used Amazing Designs' Applique Quilting Hearts Collection and chose the applique with the blanket stitch finish. The program is compatible with the AccuQuilt 55029 die. You can use the typical applique tack-down and cut method without die-cutting your hearts, but the AccuQuilt GO cutter makes the process effortless. The die cuts perfect, uniform hearts in three sizes. 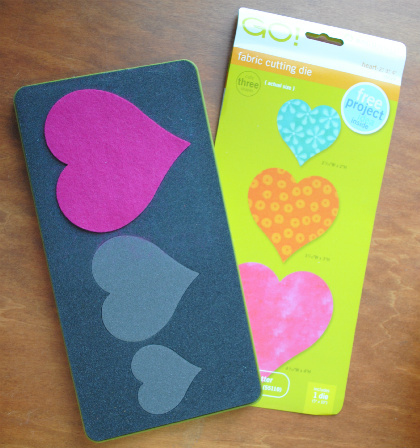 I used the four-inch heart to cut four wool felt hearts, two pink and two blue. Felt is ideal since it won't fray and keeps clean edges. If not using wool felt, be sure the craft felt is of good quality with consistent density and thickness. My favorite is Marcus Brothers. It is extremely soft (70% wool and 30% nylon), but hard to find. My source? The Stash Store. In editing software, I combined two designs in my 240x150 hoop. First, hoop water-soluble stabilizer like Badgemaster. Stitch the outline stitch so you can see where to place the wool hearts. Remove the hoop from the machine leaving the stabilizer intact. Spray the back of the hearts with a temporary adhesive and finger-press them in place on a flat surface. Return the hoop to the machine and stitch the tack-down sequence. Finish stitching the monogram, date, and the final blanket stitch outline. Remove the embroidery from the hoop. Carefully trim the water-soluble stabilizer from the edges. 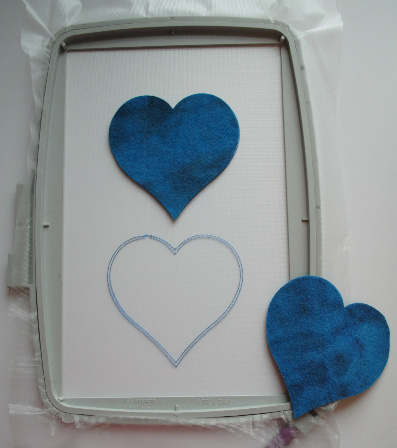 Fold a piece of 4mm silk ribbon in half and glue the lose ends to the back of the embroidered hearts. Run a bead of glue around the edge and glue the backs to the fronts, wrong sides together. Place them on a flat surface, place a lightweight flat object on top, and let them dry overnight. This would be a perfect memento for wedding guests. I'm sure you can come up with other great uses!